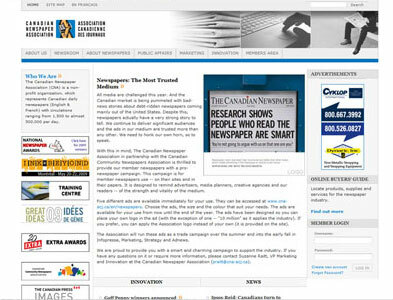 The Canadian Newspaper Association (CNA) has required a number of services from Intrigue including: website design, custom system development, content management system, custom module development, microsites (community content) and more. We have built a lasting relationship with CNA and continue to work with them to build and provide newspaper organizations with information and a place to go to manage certain aspects of their business. Intrigue build a custom web application for CNA where members can contribute their organizations numbers so CNA can collect and distribute calculated and professional reports to its members.